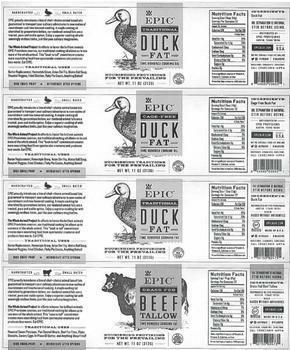 Supreme Cuisine of Montgomery City, Mo., is recalling approximately 325,000 pounds of meat and poultry fat and lard products. A processing deviation may result in the potential growth and survival of bacterial pathogens in the products. The recalled products, bearing establishment number “EST. 34595” or “P-34595” inside the USDA mark of inspection, were sold on the internet and shipped to retail locations nationwide. Customers who purchased the recalled products should not consume them, but throw them away. Consumers with questions about the recall may contact Epic Consumer Relations at (844) 370-1971.